If this card attacks a Defense Position monster your opponent controls, destroy all Defense Position monsters your opponent controls after damage calculation. This card cannot be destroyed by battle. The ATK of any monster that battles this card becomes 0 at the end of that Battle Phase. 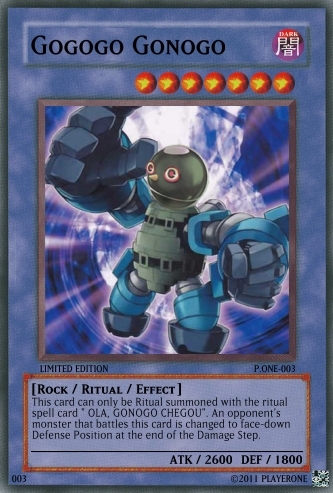 This card can only be Ritual summoned with the ritual spell card " OLA, GONOGO CHEGOU". An opponent's monster that battles this card is changed to face-down Defense Position at the end of the Damage Step. tbm sou fã do Gonogo!